From the pragmatist point of view, action is central to all philosophical problem-solving: philosophical – also conceptual and theoretical – issues are never unrelated to action. While philosophy of action is also part of other philosophical approaches, the pragmatist stance can only be comprehended as a philosophy of action. What exactly does this mean? The full implications of pragmatism’s emphasis on action still call for discussion and exploration. What is the distinctively pragmatic understanding of action? How does this understanding distinguish pragmatism from other traditions? What are the consequences of the pragmatist view to contemporary philosophical reflection on fields such as science, religion, ethics, education and anthropology? One implication of the pragmatist view concerns our understanding of our relationship with reality. The classical pragmatists, John Dewey and William James in particular, argued that the connection between human beings and the world they inhabit is centrally a dynamic, two-way relationship: both the acting subject and the world are changed in and by the action process. A closely related, second implication concerns our conception of the self and subjectivity. According to the pragmatists, the human self not merely engages in action but is a product of action. In this vein, George Herbert Mead showed how human subjectivity is born in interaction and thus rests on intersubjectivity. A third pragmatist implication is relevant for both moral and political philosophy: pragmatism’s focus on agency makes it eminently suitable for dealing with social and political issues. Existence is action – to exist is to be an acting, responsible being. This understanding of human activity opens up new ways to reflect on moral, social and political responsibility, such as that given rise to by our relationship to the environment or contemporary religious diversity and multicultural society. Revolutionary as these ideas were a century ago, some of them have recently been rediscovered in other fields of study, such as cognitive science. The basic character of action and interaction has for a long time held the attention of pragmatist philosophers. Now the notion of thought as necessarily embedded has gained ground outside of pragmatism and attracted renewed interest. 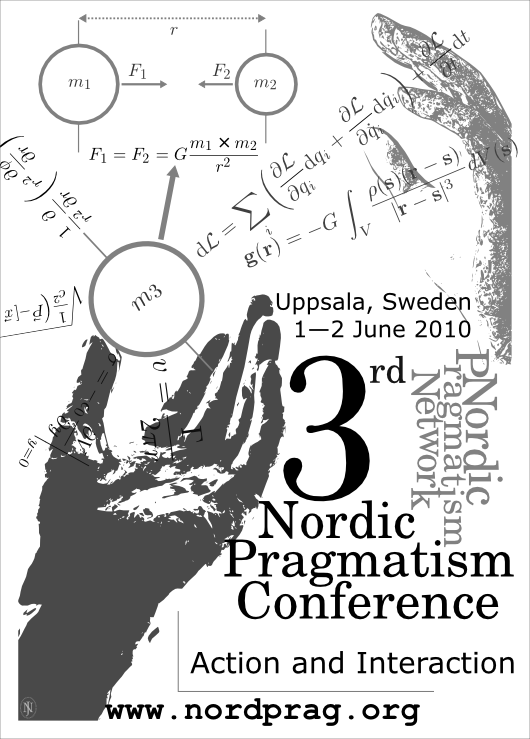 The Third Nordic Pragmatism Conference focuses on pragmatism’s view of action with the goal of clarifying its meaning and characteristics, its relation to other philosophical approaches as well as its consequences in different fields of philosophical work. The conference is organized by the Nordic Pragmatism Network with financial support from the Joint Committee for Nordic Research Councils for the Humanities and the Social Sciences (NOS-HS). The conference takes place at the University of Uppsala, Sweden, in 1-2 June 2010. The conference sessions will take place at Campus English Park, which is situated behind the University library Carolina Rediviva, near the castle and right next to the Botanical garden built up by Carolus Linnaeus and his disciples. There is a 10-15 minute walk from Hotel Uppsala to the Campus. The first sessions will take place in House 1 (entrance 3B), room 1062 (first floor). The organizing committee invites paper proposals to the conference programme. Please send an abstract of 150-300 words to info@nordprag.org by 1 April, 2010. The organization reserves the right to select presentations based on interest and suitability to the overall conference theme. If accepted to the programme, the text will be displayed in a list of abstracts on this webpage. A time slot of 30-45 minutes (including discussion of 5-10 minutes) will be alloted for each paper. Margareta Bertilsson (University of Copenhagen)When Where and How Did Rorty Misunderstand Peirce? Peirce´s categories, ‘firstness’, secondness’, and ‘thirdness’ easily flow to the surface in very diverse settings: firstness stands for chance, spontaneity but also for diffuse feelings; secondness stands for determination and direction (‘this is it’), while thirdness is law, regularity, habit. As thirdness, speech assumes a special burden: the awareness that speech-acts affect not only the here and now, but have impact upon interpretation also tomorrow, and the day after and so on demands of the speaker also ethical conduct. Herein lies the special pragmatism of Peirce, which the German philosopher Karl-Otto Apel early on called ‘semiotic pragmatism’ (1973). Pragmatism, now as self-awareness and self-control, is very far from the more common meanings often associated with the term; that pragmatism has to do with immediate utility and/or satisfaction. In this paper I give an overview, in sociology and elsewhere, of the many uses of pragmatism. I pay a special attention to how ‘ruptures’ and ‘continuities’ presently compete with one another in the reception and furthering of pragmatism. Instead of laying out a ‘correct’ interpretation, I seek to detect how present tensions have roots already in classic American pragmatism. This paper draws on an historical contrast between the philosophy of William James, especially James’ A Pluralistic Universe, and the late essays of Ralph Waldo Emerson—regarding the relationship of thought and action. Though both figures can be found to stress the need of action, Emerson gives primacy to the role of thought in the freedom and feasibility of action. The related contrast of James and Emerson on nominalism and anti-nominalism is of some importance in understanding their differences on thought and action. Developments in James and Emerson will be brought into contact with contemporary problems and developments. Also of relevance here is the contrast between action on the large scale and action of smaller or local scope. It will be argued that globalization brings many quite differing people and peoples into ever closer contact. Indeed, it strongly tends to make us all economically interdependent. Still the process of mutual understanding, across distinctive societies and cultures, is much slower. Partly in consequence, we eventually get a great deal of conflict arising, directly or indirectly, out of large-scale interaction. The argument is partly historical. Plausibly, the emphasis on action in James was stimulated, even conditioned, by his sense of growing excesses of action on the larger-scale—given the historical context of his work near the end of the Gilded Age,—combined with an emphasis on the need for counter-balancing action of the many, as contrasted with that of the “one” general system (as suggested in Hegelian monism). While nominalism on the smaller scale is not recommended here, part of the perspective is that it is sometimes more tolerable than nominalism on the grand scale. This is especially true in times of economic crisis, international conflict and over-burdening of our large-scale political and economic systems. The need to preserve large-scale accomplishments of economic and political integration and international cooperation, under similar circumstances, arguably requires renewed emphasis on the local and the particular together with a somewhat slower, more thoughtful approach to large-scale events and human affairs: more thoughtful vigor with greater attention to empirical consequences. Better understanding the contrasts of James and Emerson, it will be argued, we may better understand and deal with problems of our own times as well. This is a presentation about William James’s theories of experience set in the contexts of his experiences in the wilds of nature. Biography illuminates theory in showing the depths and motivations of his philosophical commitments, the connecting threads of many of his theories, the sources of some of his most enduring and influential metaphors, and the environmental applications of his ideas. The non-dualism of his philosophies of attentive consciousness, radical empiricism, and pluralism, emerged at least in part from his concrete encounters with the natural world. Classical pragmatism exhibited a considerable amount of influence upon the development of social theory in the first part of the 20th century, e.g. upon the Chicago School of sociology, the phenomenology of Alfred Schutz or symbolic interactionism. However, the influence of neo-pragmatism and classical pragmatism on contemporary social theory is rather limited and often more implicit (with the exception of e.g. Hans Joas). Contemporary theoretical approaches in the social sciences, e.g. Bruno Latour’s Actor-Network-Theory, mention pragmatism occasionally without aiming at a comprehensive understanding of the theoretical and systematic consequences involved. This paper will outline a theoretical framework for a pragmatic social theory that is able to conceptualize the recent practice and material turn in social theory with the notion of experience as a bridging concept for an understanding of interaction that includes artefacts and practices. The paper shall firstly present an ideal type characterisation of what is meant with ‘pragmatism’ with the help of three decisive characteristics deriving from classical pragmatism (Dewey) and neo-pragmatism (Rorty): anti-representationalism and anti-foundationalism, experimental action and finally the priority of practices before theory. These three characteristics shall serve as a background for the development of a pragmatic theory of experience in the second part. The notion of experience unfolded here will avoid both epistemological and linguistic reductions and will lead to a concept of realms of knowledge and experience within which artefacts are comprehended as parts of social actions. The philosophical analysis of experience will contribute to a richer and more varied sociological understanding of contexts of experience. The third part will present some examples and possible approaches for such a pragmatic understanding of social experience. In the recent decades, many social sciences have been under the influence of social constructionist ideas about meaning and culture. The basic argument of constructionism states that cultural meanings are constructed at the level of language and therefore texts are the proper level of empirical analysis. As is well known, pragmatism has always underscored the importance of action. At first glance, this stress laid on action is in disagreement with constructionism. However, pragmatism finds fault with constructionism only if the latter sticks exclusively to the level of texts. Texts and also other cultural artifacts certainly construct social meanings for us – that is, they enable shared responses – but whether they do so is a matter for empirical research. The object of such research should be the semiotic effects of texts; their possible effects on action rather than texts as such. I will argue that Ian Hacking’s ideas regarding so-called interactive kinds are helpful in formulating a pragmatist research agenda for the social sciences (even though Hacking does not think of himself as a pragmatist). Such a research agenda should be carried out especially in relation to historical data. In my paper I develop and use a dynamic relationalist perspective, using as key terms “transaction” and “intra-action” , which aims at overcoming the dichotomy between objectivism and relativism. This dichotomy is also sometimes referred to as realism versus different versions of non-realism, for example anti-realism or social constructivism. The pragmatist stance is often interpreteted as non-realist, but I will argue that it is more adequate to label it relationalist. Relationalism challenges the very basis for the traditional debate between objektivism and constructivism by cutting across the (alleged) divide between these two perspectives. In the relationalist perspective outlined, it is the intra-active relations that constitute reality and define subject and object. Is this, then, a way to understand reality, or is it (just) a way to understand our understanding of reality? That is: are we dealing with ontology or epistemology? Possibly the safest route would be to restrict the claim to the epistemological (like Dewey), but with the aid of Karen Barad’s thinking, presenting the key elements of her agential realism, I dare to make it into an onto-epistemological claim. The basic view of my doctoral thesis in the philosophy of religion (in progress, with the working title A Relationalist Approach to Religious Experience) is that reality is constituted by phenomena, manifested in and through a continuous intra-active process involving man as integrated within the world – not merely being in it, but of it. There are certain elements in the world of religions which are deeply immoral and which remain so, regardless of the religious arguments that may be raised in their defence. This includes, for instance, situations in which women are denied the right to be in control of their own lives or homosexuals the right to live complete lives. The problem is that it becomes almost impossible to criticise religion with regard to these issues if we allow religions to define freedom of religion on their own terms, and to do so in such a way that criticism of religion, whether justified or not, can be condemned as insult or blasphemy. I do not question religious people’s right to live a religious life; what I do question is the claim that the religions themselves should be given the interpretative prerogative when it comes to defining freedom of religion. Instead of arguing for freedom of religion, I will therefore argue for freedom of life. Our convictions and ways of life often affect people who neither share our convictions nor appreciate the consequences of our way of life. When freedom of religion is used to defend religious convictions that have unjustifiable consequences for the lives of other people, our coexistence becomes more complicated. Pragmatically speaking, the question is how we can meet and interact with each other as decently as possible, as the religious and secular people we happen to be, in these increasingly pluralist societies of ours. The main reason why I argue that freedom of religion is not a group right is that when people suffer, it is individuals, not groups, who do so. I will therefore suggest that instead of striving for freedom of religion, we ought to strive for freedom of life. My argument is based on the pragmatic idea of an interrelationship between reality and us humans as acting beings, in the sense that both reality and we change by and through our actions, together with others. The philosophies of social science are usually grouped under three headings: naturalist, hermeneutic or interpretivist, and critical. Each of these philosophical approaches offers a unique understanding of what are the requirements for social inquiry to be counted as scientific. These different understandings are notably linked with different frameworks of human action. Recently, philosophical pragmatism and it’s battery of common core commitments has been brought to bear upon issues in philosophy of social science. Beginning with Richard J. Bernstein’s Praxis and Action (Philadelphia, PA: University of Pennsylvania Press, 1971) and Jurgen Habermas ‘s On The Logic of the Social Sciences (Cambridge, MA: MIT, 1988(1969)). and The Theory of Communicative Action (Two Vols. Boston, MA: Beacon Press, 1985) in the 1970s and 1980s, and including Hans Joas in such works as The Creativity of Action (Chicago: University of Chicago Press, 1993) and more recently Patrick Baert’s Philosophy of the Social Sciences: towards pragmatism (UK: Polity Press, 2005), I would like to offer a general outline of what has been accomplished with respect to a pragmatic philosophy of social science and offer recommendations for further articulation of this robust alternative to the three schools mentioned above. Specifically, I will be foregrounding the classical pragmatist’s version of the ‘primacy of practical reason’ thesis and its consequences for the foundations of social science and a theory of action. One of the crucial achievements of American pragmatism was the transformation of the Christian notion of the soul into a concept for empirical psychological research: the “self”. William James’s chapter on the self in his “Principles of Psychology” became the point of departure for John Dewey, G. H. Mead and Ch. H. Cooley to develop a theory of the social constitution of the self and the fundamentals of a sociologically oriented social psychology. While we should consider this an epochal breakthrough in the history of philosophy and the social sciences, we might also ask whether the proponents of an intersubjectivist conception of the self also had to pay a price for what they achieved. The meaning of “soul” was richer than what they assumed. It also contained the idea of a “sacred core” of every human person and left room for religious ideas about human immortality. It is my thesis that William James was more sensitive than later pragmatists in this regard and that we have to take up some of his ideas for a contemporary conception of the self. According to the American pragmatist C.I. Lewis, consistent experience requires concepts. Lewis describes concepts as anticipatory schemata on grounds of which one can judge whether a given element of experience should be classified one way or the other. On Lewisʼ account, the activity of the perceiver is critical to the consistency of experience. Lewis calls this pragmatic dimension in concepts sense meaning. A person must be able to anticipate that certain kinds of actions are performable on an object in order to be able to verify those actions at the encounter of such an object. Thus it is argued that concepts are aggregates of anticipatory actions on the grounds of which we judge whether an object belongs to one class or another. Furthermore, there is a social element involved in coming to possess concepts. The activity involved in classifying objects is learned in social interaction with other members of the community. Such actions that repeatedly produce viable and socially sharable results are incorporated as anticipatory criteria in a given concept. Such actions that obstruct cooperation will, in turn, be gradually weeded out. In this presentation, Lewisʼ theory of concepts is explicated. More particularly, the nature of sense meaning is studied in detail. The relevance of the activity of the perceiving subject is scrutinized, and the importance of the anticipation of reproducible and socially sharable action in classifying objects is defended. In my presentation the task at hand is to present a pragmatic philosophy as the one that overcomes dualistic perspectives and reductive cognitive attitudes which do not take into account the full range of dependencies and unified relations between the individual and the community and the private and the public. The realization of the outlined undertaking will allow us to perceive the meaning of pragmatic philosophy in the shaping of a new understanding of the position of the individual in democratic society and to redifine our undesrtanding of the community. The voice of the pragmatists would seem to solve various controversies which have arisen, for example in the debate between liberalism and communitarianism, mainly on the matter of a ‘turnaround’ taking place in the direction of the overcoming of the dichotomous divisions for the perception of variety and process which feature in our cognition, as well as social and political interactions. By taking such a pragmatic perspective under the consideration we can also draw a new understanding of the notion of freedom – freedom as responsibility, which can be of enormous importance for the formation and developement of civil society today. We can say that the goal standing in front of us and democracies around the world is strenghtening civic participation, public deliberation and the development of civil society based on liberal values and rooted in pragmatic notion of freedom as responsibility. Such notion should be taken into account during the current social and political changes. When Where and How Did Rorty Misunderstand Peirce? It is widely known that particularly toward the end of his philosophical career Richard Rorty, the renovator of the pragmatist movement, did not have a high opinion about the views of the movement’s founder, C. S. Peirce, but called him nonchalantly “just another Kantian” and so. This has aroused ire among Peirce aficionados (Susan Haack et al.) and is surprising in view of the fact that Rorty received his original philosophical education from some bona fide Peircean philosophers, as Neil Gross’s excellent study informs us. The answer to this conundrum is in what is known as “the linguistic turn” in analytic philosophy. Rorty erroneously equated Peirce’s theory of meaning with the linguistic interpretation of meaning. In this article we are looking for thematic connections between Fichte’s and Mead’s theory of social action. Both abovementioned thinkers, although coming from different philosophical traditions, have a theory of intersubjectivity. According to a common misunderstanding, Fichte was a dedicated subjective idealist. Despite his strong intent to analyze (self-) consciousness and conceptualize it by the notion of I (Ich), he also attempted to develop the theory of the empirical genesis of an individual human being. His early writings from the so-called Jena period involved strongly a social ontology. He attempted to reconstruct the conceptual conditions that must be fulfilled when speaking about the empirical I and its constitution. Fichte thought that a rational and autonomous human being can only evolve in social relations. Thus, the other is a condition for the genesis of the empirical subject, and interpersonality must be understood as a necessity for it. Mead’s philosophy of intersubjectivity is based on the theory of subjectivity and experience in a social environment. Mead makes a classical distinction in the concept of Self between “I” and “Me”. “I” can be understand as an individual’s activity being non-determined. “Me” is an individual’s action where an object created in social action is part of the individual’s Self. When two individuals understand some social object by the same, not identical, it is possible that the object is understood as a sign or significant symbol and further in language. When an individual can understand by language what he or she is doing, he or she can also analyze what other people are doing or how they are acting. This process means so-called role-taking and involves a recognition of the other. Human beings are thoroughly active – cannot but transact with their environment all their lives. And in their (more or less coordinated) social actions, people interact with each other and influence one another and form communities. Sociology in particular investigates social action. “Social mechanisms” – the latest Holy Grail of sociologists – have all but replaced “social laws” in the discussions of social theorists and methodologists these days, but what exactly they are and what is their relevance is far from clear. However, considerable headway for understanding mechanisms has recently been made by, for example, Peter Hedström, who identifies himself an analytical sociologist, and by Neil Gross, a representative of the ever so diverse pragmatist camp. From a specific methodological relationalist viewpoint, this paper compares and contrasts the analytical sociologists’ interpretation of social mechanisms with the Gross’s “pragmatist theory of social mechanisms” and some other pragmatist viewpoints too. Discrepancies and possible weaknesses of various views on social mechanisms are scrutinized herein – paying special attention to the methodological usefulness of the mechanism concept in the sociological practices where working sociologists carve up social life with their conceptual tools so as to make sense of the web of social action. Since we understand mechanisms as methodological tools, a theory of mechanisms (like the one Gross seems to advance) sounds to us as useful as a theory of hammers or forks; but of course tools can be sharpened with methodological grinding, paying careful attention to the practices they are used in. Richard Rorty defends a strong form of anti-representationalism: he denies that we should see the adequacy of our assertions in terms of whether they correspond to worldly states of affairs or facts, given independently of any attempt on our part to frame coherent and justifiable thoughts. There is no such thing as ‘objective truth’, whatever that might be. Rorty thinks that to a large extent the squabble between those that do and those that don’t think this is a purely ’academic’ one, without implications for first order inquiry. However, he hopes that the view he defends will in the long term have some desirable effects. In particular, once we have ridden ourselves of our obsession with ‘mirroring reality’, we will be able to develop vocabularies that have a more direct focus on improving society. For this purpose, moreoever, natural science need not have the privileged role in our academic pursuits that it has been taken to have since the Enlightenment. I think Rorty’s anti-representationalism is defensible. I consider a couple of recent critiques of Rorty’s anti-representationalism due to Paul Boghossian and Simon Blackburn. For Boghossian, Rorty is a kind of fact-relativist and thereby ultimately incoherent, but this critique fails completely because it takes no heed of Rorty’s minimalism about truth. Blackburn’s more subtle critique aims to suggest that ‘representing reality’ is just one of the things we common sensically do with language – that is, in some truth-apt discourses but not others. But this too fails because (or so I shall argue) Blackburn cannot without denying minimalism draw the distinction between copying and coping that he needs. The conclusion to draw from this is a kind of philosophical quietism, which denies the possibility of metaphysics. Rorty’s pragmatism goes too far, however. Since we can make nothing of the coping/copying distinction in general, Rorty cannot see utility in a broad sense as a goal distinct from that of knowing truths. Further, he offers us no reasons for rejecting a reasonable naturalism, on which natural science will provide us with better or more fundamental knowledge than, say, literary criticism. Ultimately, this conclusion also carries the metaphilosophical lesson that Rorty’s insights concerning representation have more in common with Wittgensteinean therapy than they do with anything worthy of calling neo-pragmatism. It is impossible to assess, or even to understand, James’ ethical thought without recognizing its grounding in the concepts of action and truth. As an instance of this method, I shall claim that in order to acknowledge the deep commitments underlying James’ moral philosophy we have to explore its psychological and epistemological sources. Articulating James’ considerations on the nature of action will be a way to uncover the philosophy of psychology underlying his conception of morality as the expression of our practical identity. Similarly, investigating the concept of truth and its frère ennemi invention will allow me to bring to light the epistemological framework that allows us, as agents, to have a contact with the world that is ethically relevant. It is only from this pragmatist standpoint that we can fully appreciate James lesson about the nature and point of moral thought. According to this picture, the agency of human beings reflects the possibility of their grasping the moral saliencies that make claims on their sensibilities and understanding. This framework allows to develop a new interpretation of James’ seminal article ‘The Moral Philosopher and the Moral Life’, whose rhetoric has been often misleadingly read as a piece of utilitarian moral theory. According to this alternative reading, James is neither interested in advancing a theory of morality whatsoever, nor in setting forth a conception of ethics which stands in splendid isolation from the human beings inhabiting it. His point is rather that of gesturing toward the varieties of ways in which we agents can be –or fail to be– touched by situations that prompt our sensibility and understanding to respond ethically, as it clearly results from the dialectics of two other texts imbued with moral instructions such as ‘What Does It Make a Life Significant?’ and ‘On a Certain Blindness in Human Beings’. As human beings we can never escape our embeddedness within the world of experience. Additionally, our mode of being within this world of experience is one of an actor. To exist is to act. Accordingly, philosophizing itself should be understood as one possible form of action among others for particular human beings. We philosophize within our lives and our philosophy is always bounded by our particular life-conditions. The aim of this paper is to explore what follows from taking seriously this notion of philosophy as a form of action emerging from the experience of life. The exploration of these themes is heavily inspired by James’ and Dewey’s view of pragmatism as an attitude. It is argued that because of the certain inevitable circularity in understanding philosophy in a way that stays constantly conscious of its own underpinnings means that it can first be adopted only as an attitude rather than as a full-blown theory. It is argued that the consequences – or should we call them derivative attitudes – flowing from adopting this attitude involve certain anti-foundationalism and commitment to the principle of fallibilism. It also becomes natural to transcend certain traditional philosophical dichotomies including that between facts and values and that between acting and thinking. In reconstructing Dewey’s theory of democracy Axel Honneth argues that Dewey’s conception of communicative freedom springs from a conception of communication as communal cooperation, not intersubjective speech (as in Habermas’ and Arendt’s theories). On Honneth’s interpretation, Dewey’s conception of communicative freedom thus presupposes that agents already in the pre-political sphere must be able to orient themselves toward a jointly shared good if they are to experience their activity as contributing to a cooperative process. However, Honneth does not consider Dewey’s analysis of the process through which such action orientation is formed. The latter analysis is developed through works such as Human Nature and Conduct (1922), “Three Independent Factors in Morals” (1930), and Ethics (1932). Through analysing independent sources of the general notions of Good and Right in moral experience, Dewey accounts for the capacity to orientate oneself toward a common good in terms of a communicative and educative process of responding to the claims of others. Accordingly, the mature Dewey’s normative conception of communication should be construed not only in terms of orientation toward common goods but in terms of a process enabling such orientation: the process of responding to claims, and of giving and asking for reasons for claims. I end by pointing out how such an account of communication bears on Dewey’s theory of democracy. “No ought from is” is David Hume’s famous slogan. Facts and values must be sharply distinguished from each other, and values cannot be derived from facts. However, what counts as a fact depends on one’s notion of experience. According to classical empiricism experience is sense perception. One cannot literally perceive values, therefore they do not belong to the world of facts. In John Dewey’s pragmatism the notion of experience is different. Experience is concrete interaction with the environment. The object of knowledge is not the perceived environment at a certain point of time but the relation of an experienced situation to a future situation that is an outcome of some controlled operations. The object of knowledge consists of guided processes of change. In other words, the world is not experienced as perceived individual objects, qualities and relations but as possibilities of action. And when there are several possibilities of action, there are also evaluations and comparison between anticipated outcomes of action. The outcomes are evaluated on the ground of what is the value of the different outcomes for the agent. This entails that the pragmatist’s world of facts contains all the available possibilities of action and the evaluation of these courses of action. The conclusion is that the relation between facts and values is just the opposite of Hume’s dictum: Facts and values are inseparable in experience. Hume’s guillotine is valid only as a logical principle. From sentences that describe certain aspects of the perceived world one cannot logically derive sentences that contain evaluations. William James anticipated Nelson Goodman’s doctrine of world-making. Both hold that there is no ready-made world. Worlds are made and many. In this paper I will focus on the act of world-making. First, I will elaborate on the concept of world-making by comparing James’ view with Goodman’s. Although Goodman has indicated that his doctrine of world-making was inspired by James; he has not written on the views of James. The focus will be on the act of world-making by using symbolic systems and the problem of pluralism of worlds. Goodman seems to be a more radical pluralist than James is, for according to Goodman, worlds are many and irreducible. James holds that worlds are many; but he does not seem to believe that they are irreducible. Second, I will reflect on present-day and future ways of world-making. One often hears that we are living in the information age or the digital age. Starting from Lev Manovich’s idea that databases and algorithms are symbolic systems, I will argue that databases and algorithms are the most important ways of world-making at this moment and that our future worlds are made by it. The upshot of the paper is that our relationship with reality is to be understood in terms of world-making. It is up to pragmatism to explain the present, past and future worlds we make and inhabit. Charles Peirce is well known as the father of the defining maxim of pragmatism, which was essentially a philosophical doctrine, a certain conception of meaning for “intellectual concepts”. Peirce’s conception of philosophy, in turn, identified philosophy as a special branch of theoretical sciences and about them, Peirce said following: pure science has nothing at all to do with action. I.e. also pragmaticist philosophy should have nothing at all to do with action. The closer scrutiny of this apparently self-refuting conclusion will lead us to more detailed conception about the roles of action and practice in Peirce’s pramaticism. Even if the focus is limited in science, at least six different but interconnected roles of action are found and four of them are considered: (1) Action (“practical bearings”) in the pragmatist concept of meaning and closely related (2) the pragmatist concept of belief as (semiconscious) habit of action; (3) Peirce’s conception of science: science identified with its action – inquiry (and not with its beliefs or doctrines); (4) Although the practical applicability should not be taken as the criterion of success of an inquiry in theoretical sciences, science may still have an impact on human action. When the process of an individual inquiry ceases and its results will get the status of “established truths”, these results become believed without any genuine doubt. Results of scientific inquiry, whether true or false, will be gradually embedded in common world view and practices, and as such they change the corresponding habits of action. This communal unison should not be taken as a normative criterion or a sign of a success of an inquiry —nor a goal of an inquiry— but just a description of what happens in a fixation of belief. For Dewey and Mead, especially, the sociogenesis of language, mind, and meaning plays a central role in human development. This insight is shared by activity theory, and, in particular, Lev Vygotsky’s insistence on the dynamic nature of meaning making. Together, these scholars provide us with a deeper appreciation for the sociocultural nature of language learning and subtle ways in which human beings navigate intercultural and interinstitutional interactions. The time is right for a productive combination of social pragmatism and fourth generation activity theory, with the field of educational technology being a ‘crucial experiment’ of sorts. A socially pragmatic approach to human computer interfacing, I argue, yields participatory design (http://cpsr.org), multimodality (http://uclinks.org/reference/research/Hull_nelson.pdf), and optimal possibilities for multicultural education (www.uclinks.org) as productive fields of open inquiry, sustainable innovation, and creativity. In this multimedia presentation, we celebrate these three ways in which pragmatism continues to speak to us from the future. From the point of view of a pragmatic philosophical anthropology, according to which human beings are problem-solving agents seeking a state of equilibrium between organism and environment, it is rather natural to understand religion as a kind of problem-solving, performing some function in our lives. Now, if an articulation of such an understanding is going to have a pragmatic value, it ought to improve our ability to understand and deal with problems both within and outside religious practices. I will discuss whether and if so how pragmatism can meet that demand with respect to religion via a discussion of two challenges: that pragmatism may license wishful thinking, and that pragmatism’s instrumental view of human conduct fails to take certain human practices, such as religious practices, seriously enough. Central in Dewey’s perspective on knowledge is action, progress and experimental inquiry. The controversial social epistemologist Steven Fuller has been advocating an interpretation of knowledge as determined by political powers. Fuller doesn’t deny the importance of experimental method. Like Dewey he sees that there are no other means to determine puzzling phenomena than by experimental action in the form of systematic studies. The point Fuller makes regarding the social dimension of knowing is that there is nothing else available except human thought to determine what good knowledge is. Fuller thus proposes a remaking of epistemology, changing it into knowledge policy, which focus on the management and evaluation of knowledge standards. In many parts Fuller’s ideas, and the later interpretations by Remedios, are close to Dewey’s ideas. Remedios concludes his study of Fuller’s ideas by saying that “Fuller offers an ethical and political solution rather than an epistemic solution to the problem of knowledge in society”. This is a point which Dewey doesn’t develop in his theory of inquiry, where he mainly sticks to the epistemological implications found in practical and theoretical means for development of useful propositions about the world. He doesn’t say too much about who is to determine what constitute good knowledge standards in society. I this paper I will present Fuller’s and Dewey’s central ideas about knowledge production and how close Fuller stands the pragmatist ideas of Dewey. I will also point out where Fuller seems to disagree with Dewey. I see Fuller’s ideas as touching on a very important issue in the context of a pragmatist progressive perspective on knowing and development in a global trading community.